An irregular heartbeat, also known as an arrhythmia, occurs when one's heart is beating differently from its normal rhythm. Irregular heart beating can be experienced too quickly, too slowly or erratically. This condition is common among people of all ages and generally nonlife-threatening, but should be monitored carefully, as it can cause or signify an underlying health condition. Luckily, there are a number of changes that can be made in order to lessen the effects of an irregular heartbeat on a woman's life. 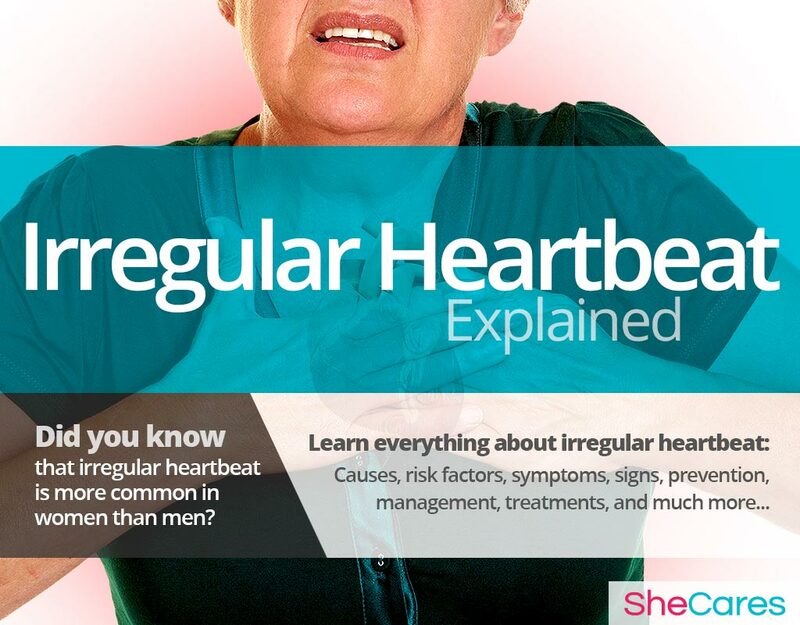 Keep reading to learn more about irregular heartbeat, and the causes, risk factors, signs, prevention and treatment options available. Brief experiences of a rapid, strong or irregular heartbeat, are felt by people of all ages, and are more common in women than men. A recent study suggests that one in four Americans over the age of 40 is at risk of developing an irregular heartbeat. 20% of healthy adults will experience an instance of irregular heartbeat within any given 24 hour period. For most adults, the average heart rate is 60 to 100 beats per minute, and deviation from this average while at rest may warrant medical attention. Frequent irregular heartbeats affect about 5% of people, and are more common in adults over the age of 65. An irregular heartbeat is characterized by fluctuations in the speed in which the heart pumps blood around the body, which may become too rapid, too slow, or generate the sensation of a “fluttering” feeling in the chest or the lower neck. Because each individual's normal resting heart rate differs, an irregular heartbeat can often be difficult to measure or diagnose. People may experience an irregular heartbeat constantly or intermittently, and abnormalities can interfere with daily functioning. 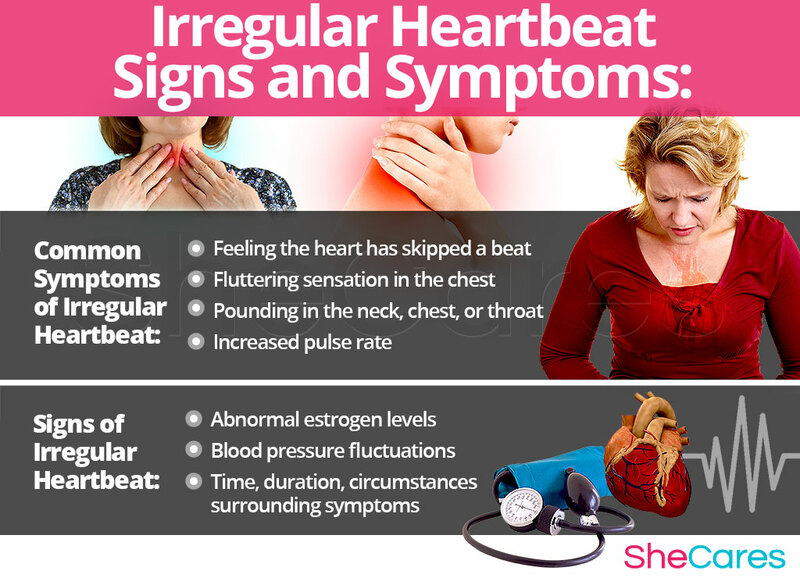 During the main periods of hormonal fluctuations that women go through during their reproductive lives, such as puberty, pregnancy, post-partum - including breastfeeding - and menopause, it is common for women to experience episodes of irregular heartbeats more frequently than before. There are two ways to classify episodes of irregular heartbeat, depending on the duration of the episodes and the type of irregularity that is being experienced in each episode. In order to understand the processes behind irregular heartbeats, continue on to the next section to read about their hormonal and non-hormonal causes. Learning about the causes of an irregular heartbeat provides the key to understanding how to prevent and treat these troublesome attacks. While the exact causes of an irregular heartbeat are complex and not completely understood, most doctors and researchers believe hormonal changes are the primary cause of an irregular heartbeat. In addition to these completely normal hormonal causes, other factors and medical conditions can, in more rare instances, cause an irregular heartbeat. Continue reading to learn more about both the hormonal and additional causes of an irregular heartbeat. Hormones are chemical messengers that control every process in the body, so when changes in these hormone levels occur, certain health disorder can arise. Medical researchers have found that fluctuating levels of hormones, especially estrogen, make women more susceptible to arrhythmia because they help control and regulate the autonomic nervous system, which in turn control hear rate and hear pressure, among other vital functions like respiratory rate and digestion. An excessive fluctuation in estrogen levels at certain points of the menstrual cycle and during phases of significant hormonal imbalance - puberty, pregnancy, post-partum, and menopause - can interfere with autonomic function and cause the heart to go faster or slower. In this sense, we can say that an irregular heartbeat is largely caused by the hormonal fluctuations during the changes women go during their reproductive life. Furthermore, there are also specific hormonal causes and typical environmental factors which can explain the occurrence of an irregular heartbeat according to the stage of a woman's reproductive life in which this disorder appears, such as around PMS and during puberty, pregnancy, post-partum, and menopause. Puberty is the phase when a girl's body starts producing the reproductive hormones; estrogen, progesterone and testosterone. These hormones, coupled with other factors can cause irregular heartbeats to occur. Pregnancy leads to extreme changes in the production of reproductive hormones, which along with other factors, like fatigue or bodily changes, can lead to an irregular heartbeat. Postpartum and breastfeeding is another stage where reproductive hormones are imbalanced, leading to symptoms like irregular heartbeats. Also, other factors contribute to an irregular heartbeat during postpartum, like postpartum depression. Menopause is the stage in a woman's life when production of reproductive hormones naturally declines, signaling the end of a woman's fertility. As well as hormonal causes, other factors add to the reasons for an irregular heartbeat during menopause, including the experience of other symptoms of menopause. 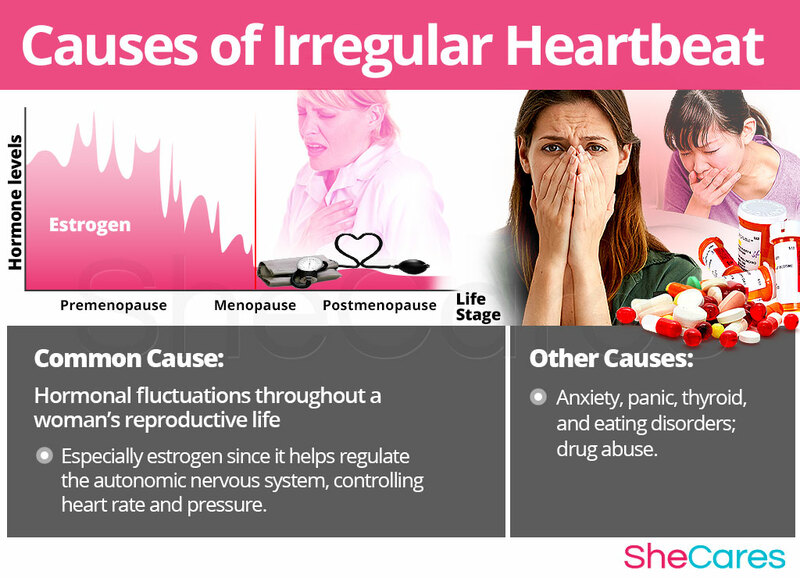 While hormonal imbalance is the major underlying cause of an irregular heartbeat during a woman's life, experts also point out that these disturbances may be caused by other, less common, underlying conditions including anxiety and panic disorders, thyroid disorders or drug abuse. Keep reading to learn more about the risk factors and triggers for irregular heartbeat. Some women are more likely than others to suffer from an irregular heartbeat for inherent behavioral, health-related and psychological reasons. These predisposing factors can affect a woman's hormone levels and increase the chances that a woman will develop an irregular heartbeat during her reproductive life. Continue reading to learn about the triggers of an irregular heartbeat. In addition to long-term risk factors, an irregular heartbeat can also be triggered by other more controllable habits and environments. Thankfully, once the behavior causing the trigger ceases, heartbeat patterns will often return to normal. Avoiding these habits and better managing one's reaction to these unhealthy environments may help to decrease the onset of symptoms of an irregular heartbeat. Continue reading to discover more about the signs and symptoms of irregular heartbeat. Heart arrhythmia may cause a lot of anxiety in women who experience its symptoms, but most of the types of arrhythmia are harmless. Ways to treat an irregular heartbeat are numerous and usually very effective, ranging from standard medical treatments to natural ones, such as herbal supplements or meditation. There are many medical signs and symptoms that can help to identify an irregular heartbeat. Continue reading to learn more about the medical signs and symptoms of irregular heartbeat, as well as what to expect during a formal medical assessment. If an irregular heartbeat is uncontrollable, or may be caused by something other than hormones, it is advised to consult a physician, who can perform tests in order to properly treat the individual case. Keep reading to learn more about diagnosis and tests for an irregular heartbeat. A doctor will perform three procedures in order to diagnose and identify an irregular heartbeat. They will review the patient's medical history, conduct a physical exam and finish with a psychological evaluation. If necessary, additional tests may be ordered or a specialist may be consulted. Following the initial assessment, further assessments which measure heart activity such as exercise stress tests and tilt table tests may be required. Most cases of irregular heartbeat however, are considered harmless and are left untreated, but all cases should be reported to a physician, to rule out any possible underlying medical conditions. An irregular heartbeat is an indication that the electrical impulses that synchronize the heartbeat aren't functioning properly. In most cases, these electrical impulses sort themselves out, and stop as quickly as they've started. Though occasional irregular heartbeats are common, especially as people age, it's a good idea to report recurring instances of irregular heartbeat to a doctor, to rule out any possible complication or cause for concern. As a rule of thumb, an irregularity can be classified as any abnormal beating that is not accompanied by exercise, fever or anxiety. These possible complications of irregular heartbeats can include exercise intolerance or even heart attacks. Continue reading to learn more about preventing and managing an irregular heartbeat. Exercising with atrial fibrillation can initially cause some uncertainty, but research confirms that it is very helpful for women with AF as it helps to strengthen the heart and promote weight loss. Any physical activity, such walking or yoga, can contribute to overall improvements in the quality of your life with atrial fibrillation. 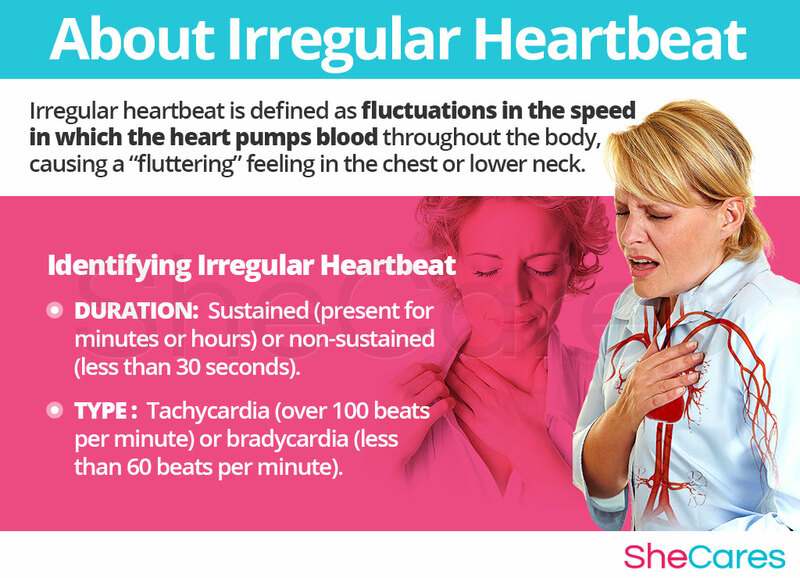 While there is no single way to completely ensure irregular heartbeats won't occur, there are some steps that can help to decrease the effects of an irregular heartbeat on a woman's life, or to minimize their frequency and severity if they do happen. Lifestyle changes for prevention are extremely important, especially with regard to diet, exercise, and healthy habits. 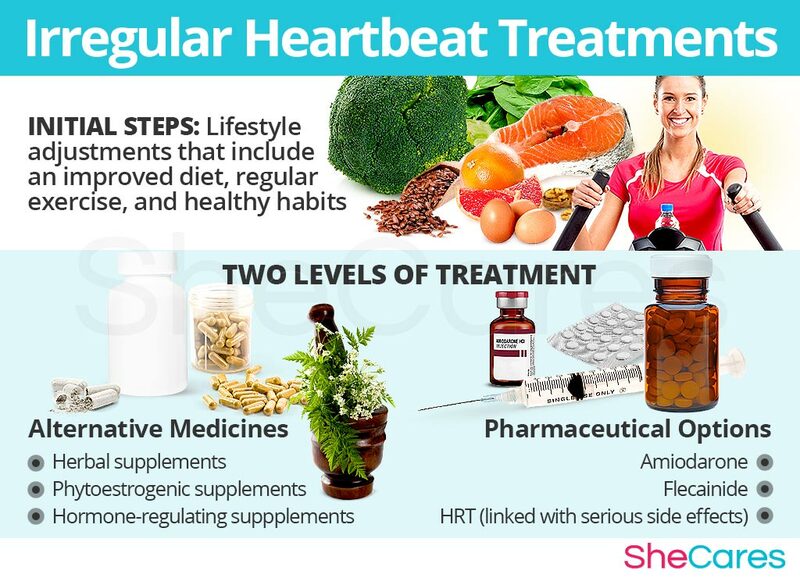 Moreover, women may seek ways to complement these lifestyle approaches with the use of supplements that help enhance the endocrine system and, therefore, help prevent or ease symptoms of hormonal imbalance such as irregular heartbeats. For women who are already going through the disorder, prevention may not be possible if irregular heartbeats have already appeared. Fortunately, there are many ways to manage them, to prevent the disorder, or to lessen the intensity of its symptoms. Keep reading to learn about the different ways to manage an irregular heartbeat. Episodes of tachycardia or bradycardia can happen at any time or any place, and severely disrupt a woman's life. However, there are effective ways to instantly manage them, and minor daily changes that can make these “attacks” less likely and less frequent. There are several strategies and general tips that women experiencing irregular heartbeats can use to cope with this condition, regardless of their age or life stage, such as relaxation techniques. It is important to treat any instance of irregular heartbeat and discover its cause, because even mild cases can progress to more serious health complications. Continue reading to learn more about irregular heartbeat treatments. Alternative treatments are another excellent way to combat an irregular heartbeat. These types of treatments do not treat the root cause of irregular heartbeat, which is hormonal imbalance, but they can provide short term relief. Alternative treatments include acupuncture and deep breathing techniques. While acupuncture and deep breathing techniques can provide temporary relief from irregular heartbeat, further treatment is required. Keep reading to learn more about treatment methods for irregular heartbeat. Cardiovascular abnormalities can indicate a serious medical condition, so it's important to treat an irregular heartbeat promptly. Women may be referred to a cardiologist or an electrophysiologist, (a cardiologist who specializes in the diagnosis and treatment of heart rhythm disorders) for special treatments if their irregular heartbeat is diagnosed as abnormal, or as an extra precaution, especially if they have a family history of heart disease or stroke. The three ways to treat an irregular heartbeat are through (1) Lifestyle Changes, (2) Alternative Medicine, and (3) Pharmaceutical Options. It is suggested to start by making lifestyle changes, as this method is both the least expensive and invasive, although it requires the highest degree of self discipline. Combining lifestyle changes with alternative therapies may also be an effective way to tackle the disorder. While pharmaceutical and medical options may not be necessary from the start, women who are unable to find relief from lifestyle changes and alternative therapies may wish to consider them after properly assessing the risks and side effects involved. This primary level of treatment involves the least amount of risk, though conversely it requires the highest amount of self discipline. 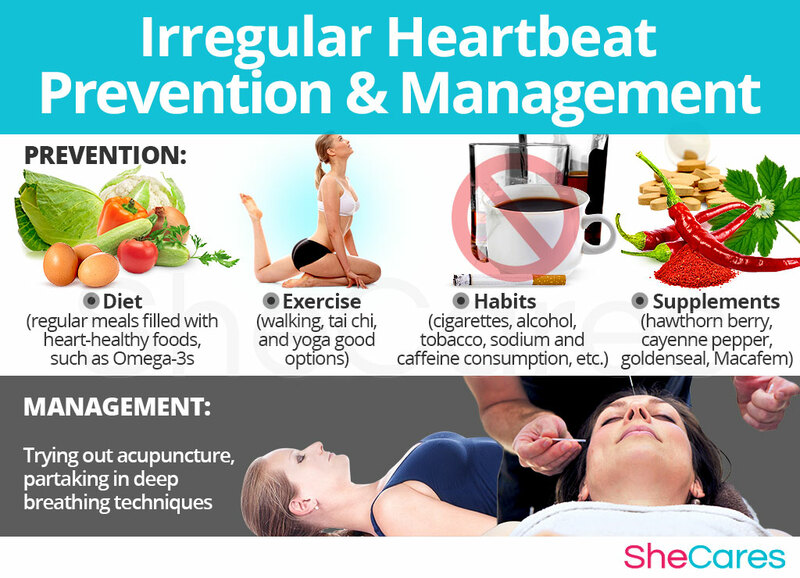 Often simple changes in lifestyle can reap huge benefits in fighting irregular heartbeats, and achieving a higher overall level of health. Fundamentally, an improved diet, exercise regimen, keeping healthy habits, and proper track of symptoms can do a woman a great service. If lifestyle changes alone may help lessening the intensity or frequency of irregular heartbeat, they do not directly address the hormonal imbalance underneath it, so further treatment may be necessary. Combining these lifestyle changes with alternative medicine, on the other hand, has proven to be an excellent way of treating an irregular heartbeat related to hormonal imbalance in a safe and natural way. Alternative medicines and supplements can provide relief for an irregular heartbeat, and involve minimal risk of side effects. There are two different types of herbal supplements that are available to treat this condition; phytoestrogenic and hormone-regulating herbal supplements. These supplements, such as black cohosh or ginseng, contain estrogenic components produced by plants that complement the low estrogen hormones in a woman's body, helping alleviate an irregular heartbeat. By introducing plant-based estrogens into the body, these herbs treat the underlying estrogen deficiency behind an irregular heartbeat. These supplements can be considered the safest and most natural way to treat the underlying hormonal imbalance behind an irregular heartbeat, and can be taken throughout a woman's life, as they support the body's natural hormone production. Additionally, there are some other types of herbal supplements that can be used to alleviate arrhythmia and promote heart health. Other herbal supplements. Evidence exists that certain herbal supplements can minimize heart-related symptoms. Hawthorn berry can help relieve symptoms of tachycardia, chest pain and anxiety, but it is not recommended for people suffering from bradycardia and may cause severe stomach distress. Cayenne pepper, although most commonly known as a spice, can be taken as a supplement to lower overall blood pressure, but if may cause painful discomforts when evacuating your bowels. For people suffering from bradychardia (slower hear rate) instead of the most common tachycardia, goldenseal has been suggested as a treatment. However, it should be handled with care because of its blood thinning properties, especially by people with a past personal or family history of high blood pressure. A combination of approaches is usually the most effective route to take. Lifestyle changes combined with alternative medicine will most likely be the best way to alleviate the symptoms of an irregular heartbeat. However, for some women the symptoms will be so severe that a more drastic treatment is necessary. Treatments at the third level involve the highest risk and often the highest cost, but are sometimes necessary. It is recommended that pharmaceutical options are taken only under the direction supervision of a doctor, and to keep in mind that not all treatments are suitable for women on every life stage. The main type of pharmaceuticals used to treat an irregular heartbeat are heart-regulating medications. Almost everyone experiences an irregular heartbeat at some point in their lives, but for some people, irregular heartbeats interfere with daily life. A combination of lifestyle changes, alternative therapies and drugs seems to be the most effective solution to cases of irregular heartbeat that are difficult to control.